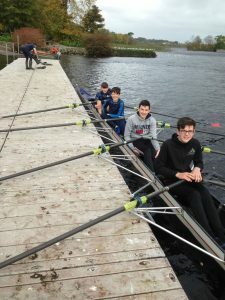 Rowing has been going well this term with students training hard both on the school’s rowing machines and on the river thanks to the generosity of Sligo Rowing Club who allows the school use their boats. 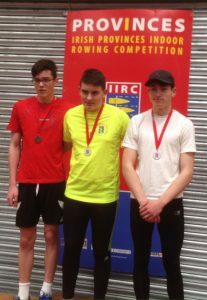 The school competed in the Irish Provinces Indoor Rowing Championship where David Barlow rowed out of his skin to win silver in his competition. 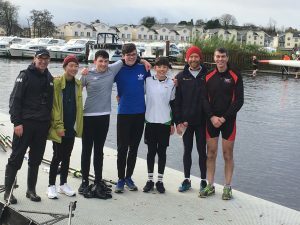 In December the team competed in it’s first river race in Carrick-on-Shannon where, although competing in a category above their age group, the lads came in 4th! The rowers are trained by Ronan Ivers who also runs circuit training in the school once a week after class. All are welcome to come along to circuit training which is a great way to get fit whatever your starting fitness level. 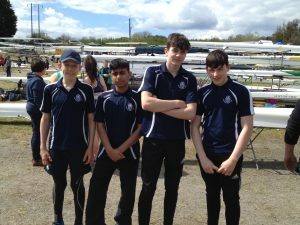 Well done to David Barlow, Joshua Hanna, Ammar Zaman and Matthew Ryan, who represented Sligo Grammar School at the Irish Schools Regatta in Limerick on Sunday 29th April. The team performed very well, finishing third. 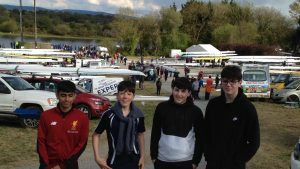 It was a close fought race but in the end the win went to Blackrock College, Dublin and second place went to An Phiarsaigh, Cork. SGS finished a length behind, claiming third prize. What a fantastic achievement for our School! Well rowed, boys!! 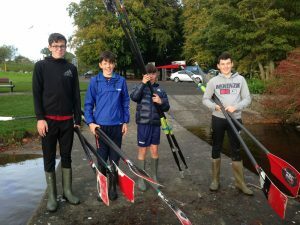 On Saturday the 25th November 2017, one of the coldest days of the year, SGS Rowing Club hit the road for Limerick to compete in their first ever competition. Fortunately this was an indoor event! 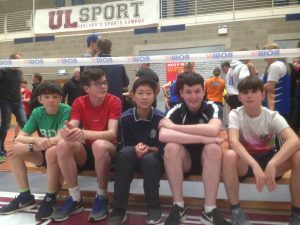 The University of Limerick Arena was the location for the Irish Provinces Indoor Rowing Championships. The annual event consists of individuals and teams racing a set time or distance on the rowing machine in a variety of categories and age groups. The event is in its fourth year, and with over 1,000 rowers entered, it certainly has grown from strength to strength. SGSRC entered three boys at Junior 13 (J13) and two boys at Junior 14 (J14) level. The five boys then came together to race in a team event. The first race of the day was the J13 500-meter sprint race with 42 rowers entered. SGS had three representatives, Matthew Ryan, Ambrose Bamber and Kyul Chan. 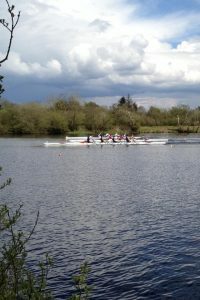 All three joined the rowing club in September and this was their first race. Pre-race nerves were widespread and evidenced by a false start, meaning that the organisers had to reset the starters orders! But thankfully, on the second attempt the race got off to a clean start. 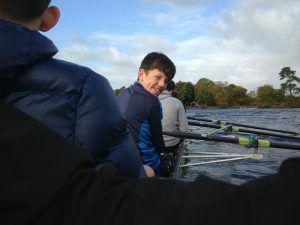 Matthew put in a strong performance with a finishing time of 1 min 55 secs, which placed him at the top end of the table – 13th out of 42 rowers. We also had a very credible performance from Ambrose Bamber, who finished in the top half of the table with a time of 2 mins. Ambrose was racing in a grade above his age so will be able to race the same category again next year, which suggests he could do extremely well at that stage. Kyul Chan finished close to the mid table also, in a time of 2 min 7 secs. This was an excellent performance as he set a new personal best (PB) time in the competition. Next up were David Barlow and Joshua Hanna in the J14 500-meter sprint. There were 36 rowers racing this event and Joshua put in a good race to finish mid table in a time of 1 min 48 secs. However, the outstanding performance of the day was David Barlow’s time of 1 min 33.8 secs to cover the 500 meters. This was an incredible effort and a new PB for David, and earned him the Silver medal for the event. 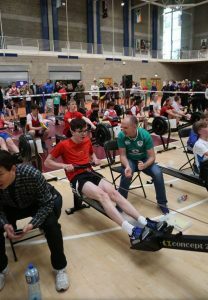 The winning time was by Ciaran O’Connell of Waterville Rowing Club who finished in a time of 1 minute 33.2 secs – only a half a second faster! While David came away delighted with his performance, he will, no doubt, be hungry for revenge the next time these two rowers meet again. In the final event of the day, the SGS boys were entered as a team. However, as the category was well above their age group, it was established before the race that they were unlikely to be strong medal contenders. In saying that, they raced very well as a team and, as hoped, gained valuable experience for future events. The club is very grateful to Mr. Chan who helped with transport to the event and for his support throughout the day. 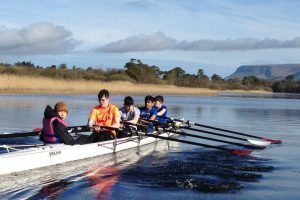 Next race for the rowing club is the Head of the Shannon regatta taking place in Carrick-on-Shannon on Saturday the 2nd December. Racing takes place at 11am and 2pm. Spectators are invited to watch the action from the jetty opposite the Landmark Hotel.